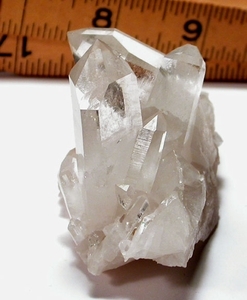 Small cabinet sized, easy on the eye and comfortable in the hand, a fine Arkansas quartz cluster with regrowing milky base is 1-3/4x 3x 2-1/4". The two larger crystals, 1-3/4 and 2" tall each have Isis faces and veil phantoms. The taller one has a foliate growth mark and a stepped face with a 3/16" doubly-terminated crystal to it. A 2-1/4" supine crystal has a tabular crystal intersecting its' underside, and a myriad of bright smaller crystals cluster around. No damage, Collier Creek Mine.